Decided to have some fun and created this as a different way to suggest than the usual. It's just two .png's and two fonts. I'll go back to the regular format if there are any issues. That way the devs can easily copy the text and add it to whatever tracker they are using. Not sure what you mean with 'stage damage'? 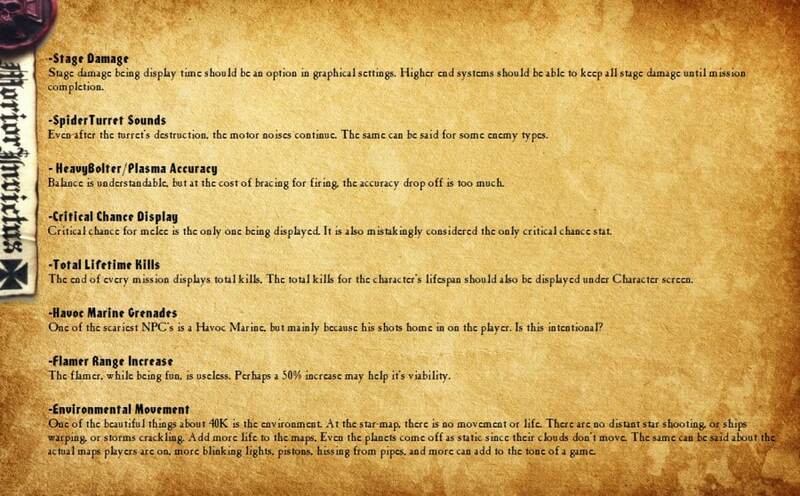 Totally agree with the heavy bolter, accuracy should be higher. Havoc marines are ridiculous indeed - I think it can be fixed rather easily by adding an immunity to knockdown, for a period, after being knocked down. This would also prevent the grenade launcher in the hands of the player of being completely overpowered. In regards to the flamer, it would be nice to know what the range is now (in meters) as by 1948 there were a flamethrower developed that could shoot up to 91 meters - I would recon that tech has been refined a bit since :D I think for game balance purpose, it should never exceed that of a las/bolt gun. Lastly I so agree on the living star map - It's beautiful in it's current state, but very much lifeless. i totally agree on the heavy boltore when i put it in to chain gun mode IE: hold left mouse an shift and plant yourself an spray bullets i get about a 20% accuracy or lower. i cant even find that mode viable in its current state i much rather use the 2 ability and blow stuff up with area saturation. Star map should show hips flying between systems . agree with op it is stale and lifeless in this state. Flamer should stay on not be a burst. The havoc yah. If it didn't knock the player down 100% of the time it would not be so bad. But when they can stun lock you just being 1 unit there its too over powered considering you cant even do the same to them, no matter what you do they always get back up even when in the same scenario you would be kept on the ground. World Barrers IE: the big imperial looking dreadnoughts that have a bazooka and a chaingun are way too overpowered. one shot doing about 1500 damage on level 2 maps. and the biggest problem is they decimate cover like swiss chease. Flamers aren't burst. You can hold down Mouse 1 to continuously fire. The sole purpose of teh 1st ability of the heaby bolter is shooting targets that are moving toward you and getting close, the closer they get the more damage you do to them. Personally I think it's fine if you use it for the right situations. Although I do kinda feel that the ability #2 over shadows everything else by being "totally awesome"
The way it is set up now, it repairs the damage done after some time.